Did you know that up to 56,000 Americans die of the flu each year, and as many as 710,000 are hospitalized because of it? The flu is a dangerous viral illness that can be lethal, or cause complications that range from pneumonia to inflammation of the heart, brain, and muscles. The good news is that flu vaccines can reduce your risk of getting the flu, and the virus tends to circulate through March, so it's not too late. 1. Can I get the flu from the flu shot? No, the flu shot does not contain live flu virus, and therefore you cannot get the flu from the flu shot. It takes a couple of weeks for the body to become immune to the flu after the flu shot, so if you are exposed to the real flu virus in that time period, you could mistakenly believe that you got the flu from the flu shot. In addition, the flu shot stimulates your immune system to react, and some people get a more robust response than others. When your immune system ramps up to fight an infection, it can cause symptoms such as soreness, redness, and/or swelling at the injection site, headache, low grade fever, nausea or muscle aches. These are usually temporary and mild. 2. I got the flu shot, and then I also got the flu. Why did that happen? The flu shot reduces your risk of getting the flu, but it does not prevent it 100%. The flu virus is constantly changing, and each year it takes time to make new vaccines for the most common strains that seem to be emerging. Scientists monitor the virus spread starting in the opposite hemisphere, and try to predict what the U.S. citizens will need when the annual flu strain(s) arrive. Some years their predictions are more accurate than others. The flu shot is about 40-60% effective, which means it reduces your risk of catching the flu by 40-60%. That's certainly not perfect, but it's the best protection we have. Other strategies to avoid catching the flu remain: hand washing (or use of alcohol-based gels), avoiding contact with infected people, bleaching surfaces that may have flu respiratory droplets on them, keeping infected people home until their fever has been gone for at least 24 hours, and taking anti-viral drugs (your doctor can prescribe them) within 48 hours of developing flu symptoms. 3. If I do get the flu, are there medicines to make it go away faster? Yes, there are are three FDA-approved, anti-viral medications that can reduce the severity of the flu and reduce it's duration by a day or two. If you are in a "high risk group" for flu complications, you should see your doctor about anti-viral medications (they are only available by prescription). But hurry, these medications only help if you take them within 48 hours of symptom onset. The Centers for Disease Control and Prevention website is an excellent resource for flu information. I highly recommend that you educate yourself about influenza and the vaccine at the links below. I hope you don't get the flu this winter ... remember to cover your mouth when you cough or sneeze, and wash your hands frequently! Have a question about the flu or another health issue? 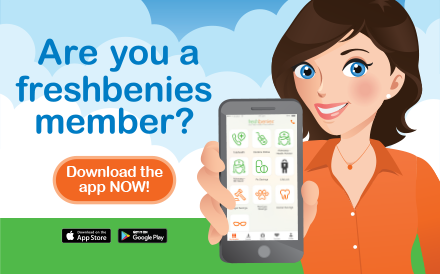 Remember, freshbenies members have access to all variety of specialists through Doctors Online. Simply use the app or portal to email questions, symptoms, and pictures with NO fee.